Jocelyn Moorhouse has a successful career as a gifted scriptwriter and film director, as well as a maintaining a marriage and a family of four children. How did she do it? Her memoir is a moving story of growing up with adoring parents and siblings. She knew early on that she wanted to be a filmmaker, and her dreams were encouraged by her family and by her teachers. Meeting P.J. Hogan, becoming parents and filmmakers together was a turning point. But when they discovered that two of their children were autistic, Jocelyn’s life turned upside down. In Unconditional Love, she talks from the heart, with humour and intelligence, about her fears for her children, the highs and lows in her international career, about Hollywood and home, and about her love for what she does best-filmmaking and motherhood. You’ve seen her beautiful movies and you have rejoiced that an Australian female director has won so many awards and accolades for her work. You may have remarked that Jocelyn Moorhouse’s most recent work, The Dressmaker, managed to convey the depths of Rosalie Ham’s novel while keeping Australian humour and landscape central to plot. Of course her memoir Unconditional Love talks about this and her extraordinary skill, but mainly this is a story about being a mother and for that I am most grateful. Moorhouse has four children, two of whom have autism, and this fascinating and approachable account is the story of a family. Moorhouse does not hide from the despair she and her beloved partner, P.J. Hogan, have experienced, nor does she shy away from the impact of living with two wonderful people with especially high needs. She did not work for eighteen years. At times they had no money. She gave up much to ensure that her son and daughter understood family and felt loved. This makes for an inspirational read, but it also serves a higher purpose: Moorhouse and Hogan’s lives are testament to the imperative sacrifices of parenthood. Many readers will enjoy this book because it provides background stories to her movies: how they were realised, what the actors were like, the festivals they all attended, and the search for funding. 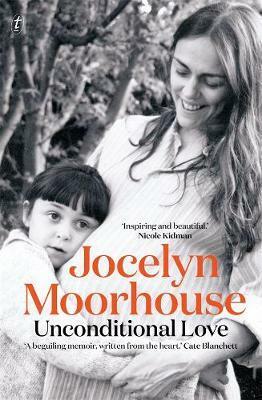 Whilst I love industry gossip as much as the next person, I read this book for Moorhouse’s experience of motherhood. Stories like hers are crucial to our understanding of what being a mother means in our modern society. Unconditional Love is primarily about surrender and acceptance, and it is undeniably about devotion. As Cate Blanchett says on the cover quote, ‘this is a beguiling memoir, written from the heart’. Chris Gordon is the programming and events manager for Readings.